You'll be £35.00 closer to your next £10.00 credit when you purchase The British Carrier Strike Fleet. What's this? In 1945 the most powerful fleet in the Royal Navy's history was centred on nine aircraft carriers. This book charts the post-war fortunes of this potent strike force – its decline in the face of diminishing resources, its final fall at the hands of uncomprehending politicians, and its recent resurrection in the form of the Queen Elizabeth class carriers, the largest ships ever built for the Royal Navy. After 1945 'experts' prophesied that nuclear weapons would make conventional forces obsolete but British carrier-borne aircraft were almost continuously employed in numerous conflicts as far apart as Korea, Egypt, the Persian Gulf, the South Atlantic, East Africa and the Far East, often giving successive British Governments options when no others were available. In the process the Royal Navy invented many of the techniques and devices crucial to modern carrier operations – angled decks, steam catapults and deck-landing aids – while also pioneering novel forms of warfare like helicopter-borne assault, and tactics for countering such modern plagues as insurgency and terrorism. This book combines narratives of these poorly understood operations with a clear analysis of the strategic and political background, benefiting from the author's personal experience of both carrier flying and the workings of Whitehall. It is an important but largely untold story, of renewed significance as Britain once again embraces carrier aviation. Those who are interested in this fascinating subject should read this book. The author followed a career in the Fleet Air Arm with a stint as curator at the Fleet Air Arm Museum, before becoming a successful author of naval aviation histories. This is a comprehensive study of the bitter sweet post WWII history of British naval aviation and will become a standard reference for its subject. – Most Highly Recommended. With it comes a deeper knowledge of how the RN carrier Strike Fleet evolved in perhaps what may have been it's golden era. If you have ever served on a Carrier and want to reminisce or simply like me you don't know a great deal about RN Air Operations I would suggest his is the book to own. This is the definitive article on post 1945 Royal Navy Carrier Operations. Heartily recommended to anyone with an interest in naval aviation. This 600-page hardback book from Seaforth Publishing is quite appropriate at this time, as we hear more about the final stages of the new Queen Elizabeth and Prince of Wales aircraft carriers for the Royal Navy and the prospect of them joining the fleet in the not too distant future. They will be the largest ships to ever have served with the Royal Navy and mark a definite change in approach. The author spent 33 years in the Navy, between 1964 and 1997, and in this time he logged 2300 hours flying both fixed and rotary wing aircraft, including some 800 carrier deck landings. Added to this, he spent time with the MOD working on Sea Harrier operational developments, along with attachments to the US Navy, dealing with their AV-8B operations. He has a wealth of experience which has put him in an ideal place to include this new book among the other naval topics he has written about. What we find here is a very detailed account of carrier operations by the Royal Navy over the years since WW2. At the end of the war we had a significant carrier force, with both light and fleet carriers. Then things began to change. As ever, pressure on defence spending led to reductions in both manpower and equipment. There was a home economy to be rebuilt and the effects of the first nuclear weapons began to change military thinking. In the early 1950's there was the Korean War and many WW2 era aircraft and carriers still available. There were also challenges of insurgency in places around the world where British Forces were involved. As well as Korea, these included the likes of Malaysia and Aden among others. The use of helicopters was growing and the development of jets rather than piston engine fixed wing aircraft meant increased costs. Then there was the Cold War and the view that the bombers of the RAF and new long range missiles would take on to brunt of the nuclear deterrent. Defence reviews were political balance sheets, and there was a view not to replace our aging aircraft carriers, so the likes of Victorious and Ark Royal with their Sea Vixens, Buccaneers and Phantoms seemed to be the end. There were three smaller ships that came to operate Harriers without the capability for catapult launches or arrester gear landings and then in 1982 one of these, HMS Invincible, and the aging HMS Hermes were faced with the challenge of the Falklands War, 8,000 miles from home. All these elements of the story and more are tackled in detail, giving an excellent view of the whole subject area, ship, aircraft, politics and history alike. There is even the detail of the plans surrounding the first Queen Elizabeth aircraft carrier, a development which was cancelled, before the new designs which have finally got to the stage of being built. Hindsight is always interesting and this is a fine examination of the history of the aircraft carrier in the Royal Navy since the end of WW2, how events have not always worked out the way we expected them to, and how we now look forward to a period when the Royal Navy will once again have two significant new ships in the fleet, able to carry out their mission world wide. I am old enough to remember events of the 1960's and beyond, of the days of the Ark Royal operating Buccaneers, Phantoms and Gannets, and of Hermes and Invincible sailing for the Falklands. The news now covers significant developments as our new carriers are being prepared for service. If you have an interest in the Royal Navy aircraft carrier then I am sure you will find this an interesting and informative book. though-provoking to note the size of the British carrier fleet at the end of the war and contrast that with the lamentable size it is today. It is also remarkable to consider what the Carrier Strike Fleet achieved in the defence of Britain and her interests with what the Royal Air Force did over the same period at a far greater cost. This is also the sad story of the end of the British Empire with the difficult run down of so many overseas territories and also the equally sad story of the shrinking Royal Navy. Though the book is organised broadly on chronological lines it picks up themes, such as the story of the British nuclear deterrent and follows them through in the relevant places. It covers the important political decision making at the time, concerning Defence, the Royal Navy and the carriers and doesn't hold any punches. It goes into the fateful decision in 1966 to cancel CVA-01 and phase out the fleet carriers, the subsequent cost to Britain and the gross fraud by the RAF that land based aircraft can achieve all that carrier based aircraft can. It comes right up to date with the protracted story of the new Queen Elizabeth carriers and the various defence reviews. It is well illustrated with many photographs inserted in the text, though inevitably the quality of the pictures is not quite as good as they would have been on hi-glass paper. A veritable tour de force this book is most strongly recommended. ... The illustrations are numerous and interesting. The dust jacket, colour picture of Victorious, Hermes and Ark Royal operating as they did in 1960 is a magnificent reminder of the past. The British Carrier Strike Fleet After 1945 is an important contribution to the history of the Royal Navy after 1945. ... David Hobbs once again has done an excellent job in bringing together this important and relevant information. His open and forthright style gives this work a timeless aspect. Hobbs provides detailed explanations that overturn many of the myths surrounding carrier operations since 1945. He does not have all the answers, and in some areas the reader may fervently disagree with his view, however this book offers a series of professional, well-rounded arguments that are supported by the available evidence. 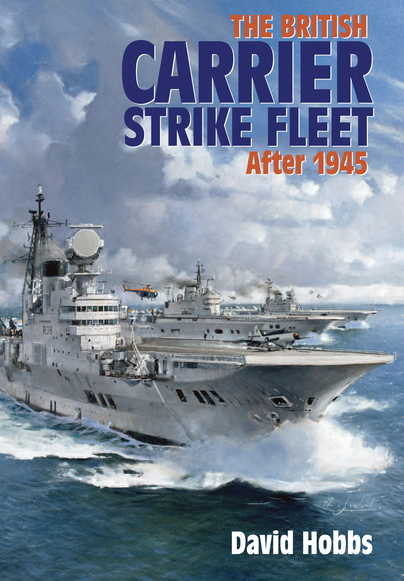 The British Carrier Strike Fleet is a must read for navy professionals and defence acquisition specialists alike. If you don’t already have a copy you need to get one! ... The author dives deep into each conflict explaining background of the events along with a complete timeline including the operational prowess of these ships and aircraft used. Along the way he breaks down the individual carriers and aircraft technically, giving the reader insight into the complex view of the situations, crews and machines showing us the crucial role they played in the strike force throughout the years. This book takes us through the carrier strike force evolution of the 1950’s straight up to present day with a complete and often complex defence review of the forces. David Hobbs has left no stone un-turned giving us one of the most in-depth, comprehensive looks at the British Carrier Strike Fleet After 1945. This book is filled with hundreds of period photographs, diagrams and maps supporting the author's narrative. I highly recommend this book to anyone interested in the post Second World War carrier fleet of the British Navy. David Hobbs uses his vast knowledge and his 30 years of experience as a naval aviator for the Royal navy to bring us this enlightening and highly technical book; British Carrier Strike Fleet After 1945. A major new book on the Royal Navy's aircraft carriers since the end of the Second World War by Crail naval historian, Commander David Hobbs, makes a timely and welcome appearance... David Hobbs knows his subject intimately. His story will make compelling reading for those with a serious concern for our naval affairs. If anyone is qualified to write about the post war Royal Navy carrier force it is David Hobbs, and he has produced an extraordinarily comprehensive and scholarly book... This is a masterly book that should be on the bookshelf of every aspiring senior officer and politician to learn the mistakes of previous administrations... This is a marvellously readable study of the Royal Navy in the post war years and I cannot recommend it highly enough. David Hobbs' book is not a lament for what might have been done but rather it is an inspiring tribute to what was done. It records in detail the operational work of the Royal Navy's carriers across half a century and across the oceans and the huge benefits which accrued. This author served in the Royal Navy for over 30 years and his Service time overlaps my own years in the navy, and much of what he has to say resonates strongly. I’m proud of the fact that the Royal Navy invented many of the techniques and devices crucial to modern carrier operations. In 1945 the most powerful fleet in the Royal Navy’s history was centred on nine aircraft carriers. This book charts the post-war fortunes of this potent strike force, its decline in the face of diminishing resources, its final fall at the hands of uncomprehending politicians, and its recent resurrection in the form of the two Queen Elizabeth class carriers, which, when built, will be the largest ships ever constructed for the Royal Navy.